On Friday evening, after two weeks in Ottawa, my wife and I were ready to return home to Toronto. There were showers in both the Ottawa and Toronto areas. We arrived at Ottawa's McDonald-Cartier Airport about 2:30 P.M. and reviewed the departure board to find our flight, Air Canada 481 was delayed until 6:00 P.M. We also saw the other Air Canada flights to Toronto were delayed as well. We dutifully checked in early to ensure we were clear of security. The Ottawa airport on both sides seemed to be pretty quiet with quite a number of empty domestic gates and a steady flow of passengers coming through security. 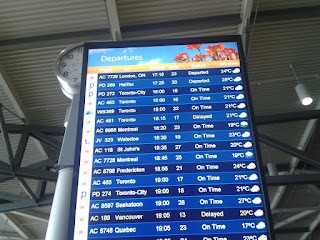 I reviewed the Departures screen again and noticed that the Air Canada flights to Toronto were still delayed. But I took a closer look, Porter's flights to Toronto's Billy Bishop City Centre was on time and so was WestJet's flights into Toronto's Lester B. Pearson Terminal 3. So why was Air Canada having such problems flying into the new Lester B. Pearson Terminal 1? The departures person who had checked our bags said the delays were due to thunderstorms in the Toronto area. That doesn't seem to wash as wouldn't Porter and WestJet have the same issues? Yet their flights were on time. At 5:15 P.M. the plot thickened even more. Our 5 P.M. flight was delayed further from 6 P.M. to 6:15 P.M. The worst part was the regularly scheduled 6:00 P.M. Air Canada flight 463 was right on time and those passengers were able to board at Gate 16 right next to us stewing at Gate 17. Eventually we board our plane and get seated. The only eventful thing on take off is the sighting of German Chanceller Angela Merkel's Luftwaffe plane sitting on the tarmac awaiting use during Angela's visit to Ottawa. Quite the site to see a foreign air service at Canada's capital. In the air though, things got interesting but not to the fault of Air Canada. Drink service was started and got about five rows before it was cancelled due to turbulance. Then we the flight went way west past Toronto to Milton before turning around to land. Interesting plane flight in to be forced to turn at the end but perhaps the wind direction forced the planes to arrive at Toronto's Lester. B. Pearson International Airport from a westerly direction. Once on the ground the adventure did not stop there. Our flight was forced to hold on the tarmac as there were no open gates for us to use. The Captain came on and explained the situation. Fifteen minutes later were on our way to the gate. But before we were able to pull up to the gate a landing crew had to be found. This took at least another five minutes for Air Canada to scramble together. It seemed Air Canada's crew at Pearson was just not ready for an Air Canada flight despite receiving delayed flights all day from at least Ottawa and maybe more originating airports. Next was the usual long walk to pick up our baggage at domestic baggage pick-up. We arrived at the four carousels to spy bags from Calgary, Winnipeg and other origins. But nothing from Ottawa despite there being at least two flights that would have arrived within hour of each other (i.e. our flight that left at 6:15 P.M. and the other at 6:00 P.M.). We waited about fifteen minutes before carousel number two, which had no origins listed, lit up that it was about to activate and the origin of "St. John's" and an flight number lit up. I was about to walk away to recheck the other three carousels when bagage started to drop. The third bag in, apparently somehow coming from St. John's, was my bag! Somehow Air Canada gave my bag the scenic route to Newfoundland from Ottawa and got it back to Toronto in the same amount of time it took me to get from Ottawa to Toronto delayed. Either that is the true story or Air Canada has no idea of where their planes are or originate at all times. I just hope the pilots know where there going after lift off. Because Air Canada doesn't seem to be able to come up with anything except lame excuses of why their planes are delayed (i.e. 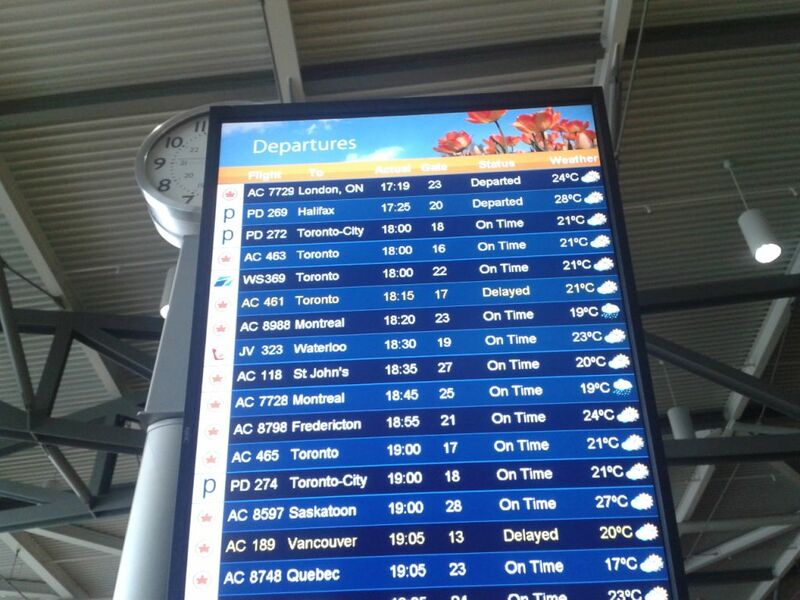 storms in Toronto while their competion, Porter & Westjet are able to stay on time), lack of coordination (i.e. having the 6 P.M. flight leave on time while the 5 P.M. flight is still not arrived yet and no landing crew in Toronto) and finally, not one apology from anyone at Air Canada for the delays and missed connecting flights for those transferring to other destinations in Toronto. The only answer to this entire situation is to book with Westjet.